One of the most distinguished apartment buildings on Park Avenue, this is also one of the citys better Art Deco buildings. Massive, but muted, it projects a dignified monumentality: it is a building in a chalk-stripped gray flannel suit. It was designed by Sloan & Robertson, the architectural firm best known for the very prominent and important Chanin Building on the southwest corner of Lexington Avenue and 42nd Street. The 19-story building, which has a three-story limestone base beneath a yellow brick facade with wide fluted limestone pilasters, was erected in 1930 and converted to a cooperative in 1952. It has 36 apartments and an impressive entrance on 79th Street, which has frequent cross-town bus service. The building has numerous decorative plaques, a very attractive enclosed rooftop watertank and consistent, multipaned fenestration. A narrow portion of the building is deeply recessed on the avenue with large, curved bay windows. Its location is in the heart of the Upper East Side, close to Fifth Avenues "Museum Mile," the fashionable boutiques and art galleries of Madison Avenue, and numerous restaurants nearby on Third Avenue and the 77th Street local station of the Lexington Avenue Subway. 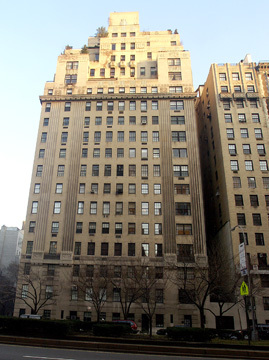 In his book, "The City Observed, New York, A Guide To The Architecture of Manhattan," (Vintage Books, 1979), architecture critic Paul Goldberger described this building as "interesting blend" of Georgian and Art Deco styles: "it is Park Avenue with just a hint of a 1930s flair." The building has its entrance on 79th Street. It has a doorman and a concierge and some bay windows and protruding air-conditioners, but no garage and no health club.